It appears that Ricoh has come to terms with Anajet on an acquisition. Ricoh Company, Ltd. today announced that the company has reached an agreement to buy AnaJet, the leader in direct to garment (DTG) printing. This acquisition is the latest strategic investment by Ricoh to strengthen its industrial inkjet business while enabling its customers to move forward new ideas and drive imaginative thinking. Located in the U.S., AnaJet will become a wholly owned subsidiary of Ricoh Printing Systems America, Inc.
As the first manufacturer to mass-produce direct to garment printers in the United States, AnaJet continues to pour intensive effort and cost into building up its capabilities and streamlining the path from idea to full-scale production and fulfillment. All of their printers are currently designed, assembled, tested, shipped and supported from their headquarters in Costa Mesa, California. 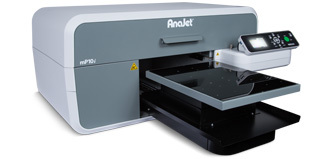 AnaJet mPower i-series printers are the fastest single-platen printers on the market. They produce the highest quality images on many types of garments, especially 100% cotton and high cotton blend t-shirts. Combined with AnaJet’s proprietary RIP software and available user-friendly design software, the mPower is an easy-to-use and easy-to-maintain industrial garment printer. Learn more about Anajet and Richoh. Learn about direct to garment printing so that you realize why Ricoh wants to expand this aspect of their business.